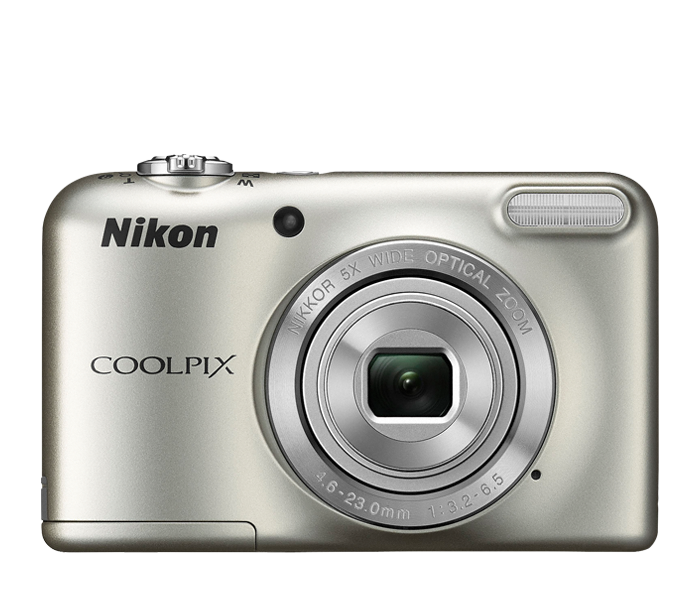 With the COOLPIX L29, creating beautiful memories of your friends and family couldn't be easier—just point and shoot! Easy Auto Mode automatically picks the best settings for your shot, while Smart Portrait System gives portraits a flattering look. Zoom in with the camera's 5x optical zoom NIKKOR glass lens for stunning 16.1-megapixel close-ups, or zoom out and record the whole gang in 720p HD video. If your hands are a bit unsteady, electronic VR will offset camera movement and keep your shots sharp and clear. For added convenience, the COOLPIX L29 runs on AA batteries, so you’ll never be stuck waiting for a charge. Convenience was considered in every aspect of the COOLPIX L29! When a photo alone won't do, press the dedicated movie button and instantly start recording 720p HD video in widescreen format while the built-in microphone captures the sounds of the moment in high fidelity. When you're ready to share your creations, connect the COOLPIX L29 (with optional cable) to an HDTV and dazzle your friends and family. The COOLPIX L29's high-performance NIKKOR glass lens is paired with a 16.1-megapixel CCD image sensor that captures bright, vibrant images. Easily match your situation to one of 17 Scene Modes like Beach, Snow, Night Portrait, Sunset and more, and enjoy effortless great shots. Or, choose Scene Auto Selector and let the camera choose for you. The COOLPIX L29 is powered by two regular AA batteries, so a fresh set of batteries will never be far from reach. It also accepts alkaline, lithium and Nikon rechargeable batteries, available as an optional accessory.